The Congressional Budget Office is basically projecting $1-trillion dollar annual Federal budget deficits for as far as the eye can see. This will require the country to pile another $1 trillion of debt on top of our existing $13.5 trillion debt load each year, which will quickly drive our national debt-to-GDP ratio over 100% (Greece-like). So, naturally, people are concerned about all that government spending. So where's it going, really? Well, when you dig into the CBO's 10-year estimates for the growth in Federal spending over the period, you find that Federal government spending is expected to increase by about $2 Trillion a year over the next 10 years. What everyone's fighting about right now, by the way, is that little green bar--"everything else"--the 2.5%. Maybe it's time we turned our attention to the other 97.5%? 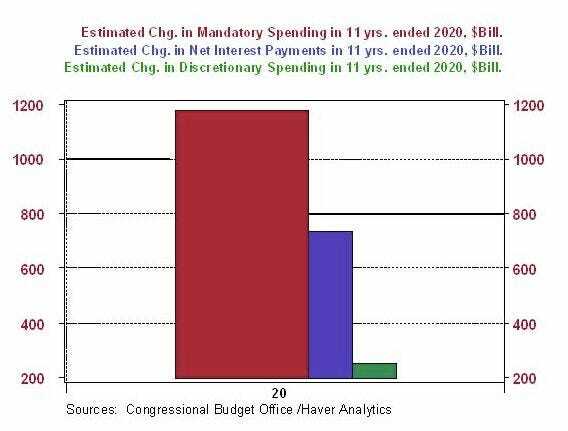 As the chart shows, the largest projected increase in spending by an order of magnitude over these years is for mandatory or entitlement programs - Social Security, Medicare and Medicaid. Demographics is the primary factor driving up these entitlement expenditures. Millions of baby boomers will become eligible for Social Security and Medicare benefits during the period covered in these projections. The second largest projected increase in federal expenditures is interest on the debt. On a percentage basis, this is the fastest growing category of federal outlays. Why is interest on the public debt growing so rapidly over this period? Partly because of the interest on all of the public debt piled up as a result of the federal budget deficits being incurred in each of the past fiscal years starting in 2002. That relatively small (green) bar in the chart represents the projected increase in all other federal outlays besides entitlement programs and interest on the public debt. The upshot of all this is that if one is serious about slowing the rate of increase in federal government outlays in the "out years," reduce entitlements for baby boomers. Good luck with all that.